(L-R) Clark School Dean Darryll Pines, Clark School Associate Professor Derek Paley, University of Michigan Associate Professor Ella Atkins, UMD VP for Research Patrick O'Shea, FAA Manager Chris Swider, and Textron Systems VP of Engineering Gregg Shimp. On July 16, the University of Maryland's Division of Research and the A. James Clark School of Engineering brought together academic, agency, and industry experts in Washington, D.C., for an event entitled “The Future Has Arrived: Research and Policy Implications of Autonomous Systems”. 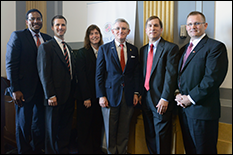 The panel, which took place on Capitol Hill in the Russell Senate Office Building, was moderated by Clark School Dean Darryll Pines and touched on issues of regulation, education and research, privacy, and economic development surrounding unmanned aerial vehicles (UAVs). Watch a video of the entire discussion or view a Storify summary of the event.